Looking for a super easy make-ahead breakfast or snack idea? 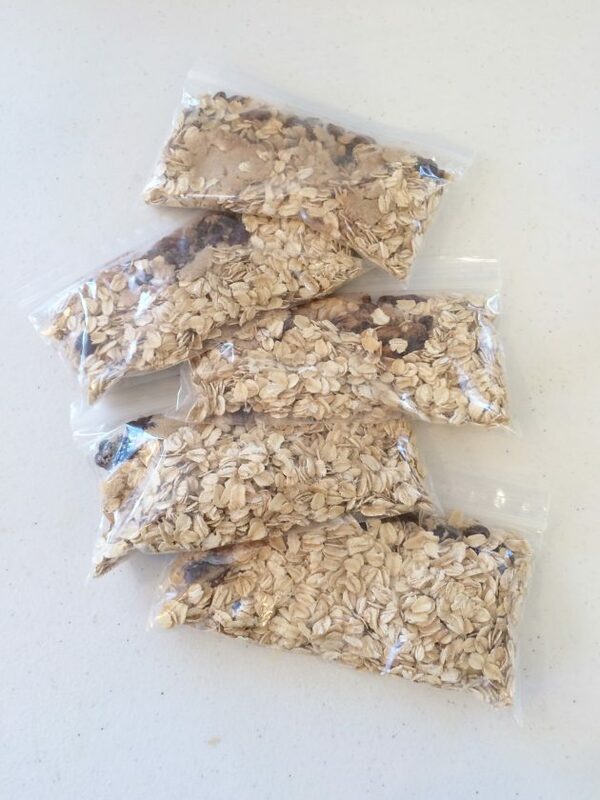 This is an extremely easy recipe for homemade instant oatmeal packets, and kids always have fun helping out with this one! The best part? You can mix it up and use a variety of different add-ins, depending on what your family loves. 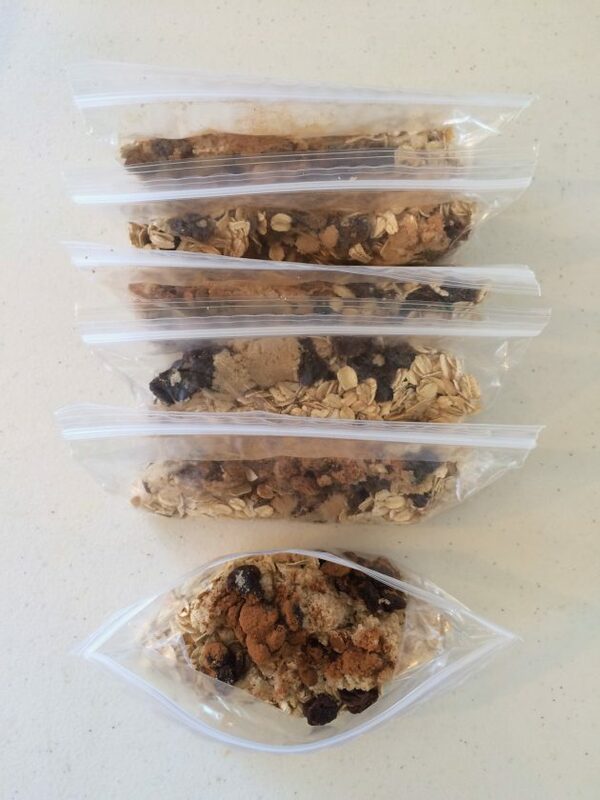 You can even make different bags for each family member, if everyone likes different types of oatmeal! Store in an airtight container or freeze for up to three months. To serve: Pour instant oatmeal packet into a bowl and add 3/4 cup water. Microwave on high for 1-2 minutes, until cooked. Stir and serve. You can also cook in a saucepan on the stove, if you prefer. Looking for more? Read more posts about 15-Minute Freezer Cooking & Freezer Cooking. « Target.com: Two Merona Dresses for $10 each shipped or four dresses for $8 shipped! I will be trying the oatmeal! I’m glad I’m not the only one! I dreamt I met you last week! You were super nice. The weird part was that I was living in Kansas! If you were to just add the brown sugar and cinnamon, how much cinnamon would you add to each bag? When I make it, I add brown sugar and pecans, but have never thought to prepackage them. Great idea! I just sprinkled in a little — maybe a 1/4 teaspoon? This would make a great start for a healthy parfait. While the oatmeal cooks in the microwave slice a few strawberries and bananas, top off with some yummy greek yogurt. Delicious! I prefer to add lots of cinnamon and bananas for sweetness and leave out the sugar. Protein from the yogurt, slow carbs from the oatmeal, and a little fat from a few nuts and you’ve got a great meal that keeps hunger at bay for hours! I love your website!! I have been following you for a few months now and recently became a SAHM after being at my job for 13 years. I look forward to trying things that you blog about here and your recipes. Thank you!!! Thanks for this post! What kind of oats—old-fashioned or quick-cook oats? I used old-fashioned, but quick oats should work, too. just wondering , is there a reason why you freeze it ??? couldn’t you just store right back in the same oatmeal container in your cupboard or no ?? I was wondering the same thing. 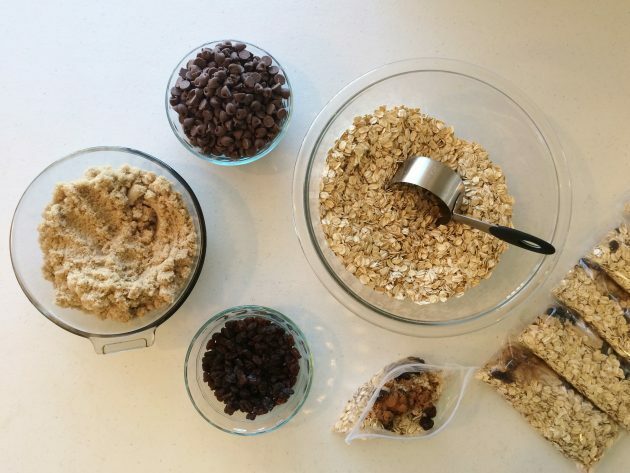 Oats, brown sugar, and dried fruit/chocolate chips are all things that can be stored in the pantry for a long time. I like your idea of putting the baggies back into the large oatmeal container! I would imagine that putting them in the freezer is to keep bugs out of the oatmeal. And, I’d also like to know if you use old fashioned or quick cooking oats (I’m assuming quick cooking, though). For a low glycemic index version try using 1/4 c. Craisens (other dried fruit would probably work too) instead of sugar. I started doing this when I had gestational diabetes and it always kept my blood sugar steady. You can just store it in an airtight container — whatever works best for you! Is there a reciepe for the BBQ meatballs or did I just over look it? Can you please share the link or recipe to the barbecued meatballs? Btw, I love your recipes and your posts… They made life ‘s burden easier and helped me be closer to God! Keep letting God use you and may He bless you and your family more and more! can you post the bbq meatball recipe? thanks crystal – you rock! I tried the instant oatmeal packets this week too. The recipe was so easy! I made it with what was left of an already open canister of oatmeal just to be sure the kids would like it. They loved it! Next time I think I will add everything to a big bowl and mix. Then scoop into the baggies. I think it may be quicker. If anyone has done it this way let me know how much brown sugar and extras you add for an entire canister. But you won’t get an even distribution of sugar and mix-ins that way–some servings could have lots of sugar, others little. I have done this for years, but I skip the step of putting them in the baggies. I mix the oats, brown sugar and raisins in a large bowl and then just put back in the oatmeal container (I save an old one so I can do a smaller amount and it will fit). Then I have a 1/2 c measure that I keep in there. Then you simply scoop oatmeal into the bowl, add water (we eyeball it), microwave and voila! I also leave a 1/2 cup in my oatmeal cannister. I recycle a cup from pudding or fruit cup. It’s been a while since I’ve frozen meatballs and you’ve inspired me to get on the ball and do it again! Even the best frozen meatballs from the grocery store are no comparison. Thanks! ….I also found that this method saves more than 50% from store bought. yay! Sorry; that’s 1.5 Tbsp of extras and sugar per 1/3 cup serving. I also serve with a splash of milk and frozen berries…. I never even thought of adding oatmeal to meatballs. Thanks for that idea! I add a tablespoon of flax seed to my premade packets. Yum! Great idea! I’m always trying to sneak some healthy stuff into the kids’ meals. I will be making some turkey meatballs this weekend. We just ran out of meatballs in our freezer from the last freezer cooking I did. 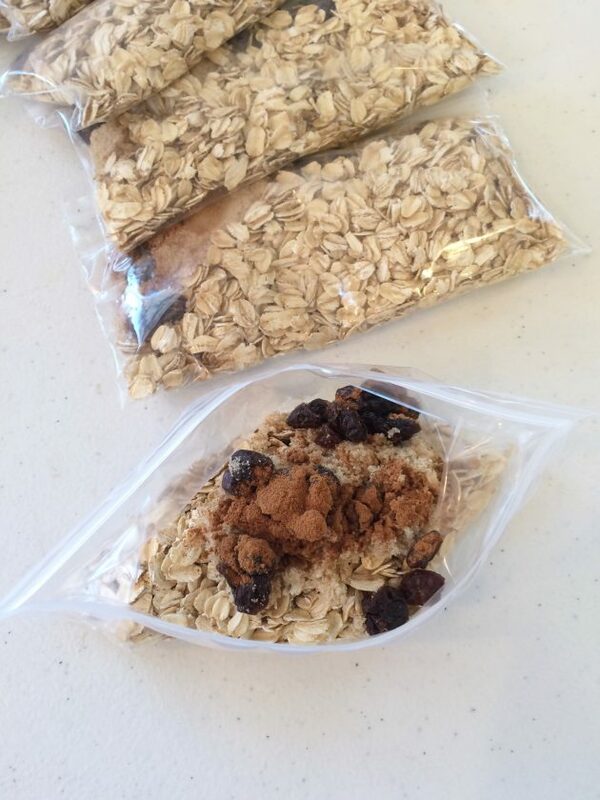 I also need to have the kids help me with making some more oatmeal packages as we ran out of them too. 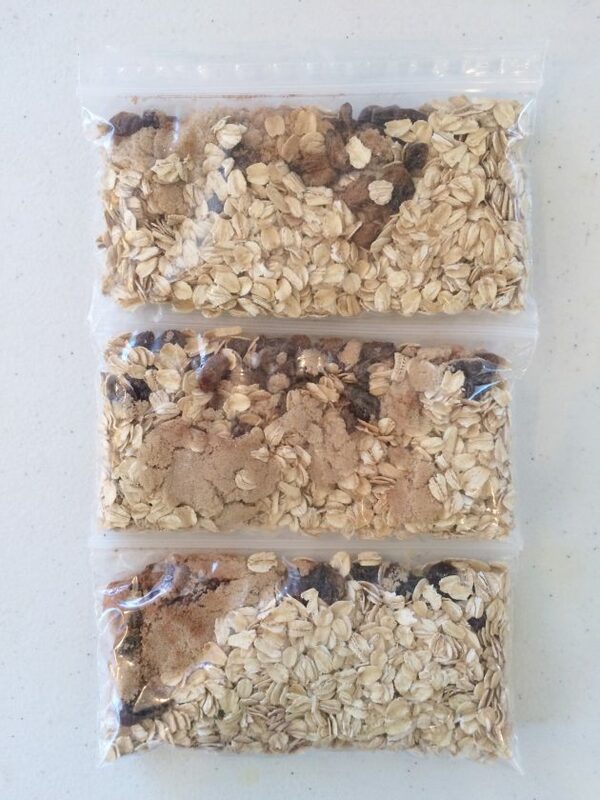 We will usually add in some of our dried fruit to our oatmeal packages. I just dried some cherries this week so we will have to try some cherry oatmeal packages this time. Dried blueberries are great, too! Trader Joe’s sells them. I dry blueberries for us too. They are a little harder to dry at home but the ones I have dried were really good. My kids are allergic to blueberries so my husband and myself are the only ones who get to enjoy them. I really do not get the premaking of these oatmeal packets, except for the fact that it would be a fun project for the kids, which is great. I usually have oatmeal every day, just pour some from the oatmeal box into a bowl, drown with water and nuke for 2 minutes. When done I add whatever I feel like and have on hand. Today it was strawberrys, walnuts, flax seed, yesterday it was just brown sugar and cinnamon. Quicker than sorting through packets to pick one I want. No cost of plastic baggies, no storage space taken up. Takes seconds. I just can’t imagine wasting all of those baggies to put oatmeal in. It takes less than 30 seconds to dump it into a bowl. Even if you have several eating it in the mornings, you still have to wait on the microwave! You can reuse the baggies! 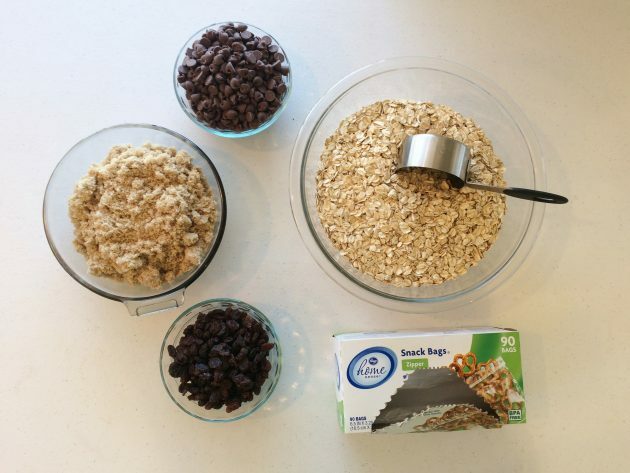 And for some, it might seem a lot easier to make a big batch of oatmeal, but these are so handy to have on hand for my girls to make for quick breakfasts or snacks! I like to make up these pre-made packets for my husband to take to work. That way he can make it right at work and eat it on morning break without having to measure and bring everything with him. Great to keep in a desk for when you are running late and don’t have time to make it at home! That’s the way I do it. I have a big glass jar on the counter full of bulk organic rolled-oats with a scoop. Scoop some out, top with water and nuke. Add whatever I feel like on that particular day. Right now I’m adding fresh local fruit from the farmer’s market. This definitely wouldn’t taste like Quaker… but after you try it for a while, you’ll wonder how you ever thought Quaker was tasty! I weaned my husband to healthier oatmeal by buying BetterOats (I think?) brand. Less fake stuff, more healthy stuff! He even started bragging about eating flax seeds! Ha! I’ve done packets before to have handy for breakfast or last-minute lunches. I like to add in dry milk powder to give my oatmeal a bit of creaminess. And a dash of salt- whenever I leave it out, it tastes funny! Dry fruit, cinnamon, and some almonds or walnuts makes this a fancy, adult breakfast that’s still healthy. My father-in-law eats the Quaker packets, and I don’t know how anyone can eat them straight — too sweet, and I have a huge sweet tooth! When eating them I have to mix half and half with plain oats. I am not an oatmeal person. Has anyone tried this with farina — to make Cream of Wheat type cereal? In the winter, this is my go-to breakfast. I would love to make it healthier than store bought packets.